The military history of the United States spans a period of over two centuries. During those years, the United States evolved from a new nation fighting Great Britain for independence (1775–1783), through the monumental American Civil War (1861–1865) and, after collaborating in triumph during World War II (1941–1945), to the world's sole remaining superpower from the late 20th century to present. U.S. military personnel and expenditures, 1790–2006. Personnel is shown in orange (left axis); expenditures are in teal (right axis). The two axes are scaled to visually align for World War II, thus showing the difference between the cost per soldier before and after President Dwight D. Eisenhower's "New Look" policy of the mid-1950s. The Continental Congress in 1775 established the Continental Army, Continental Navy, and Continental Marines and named General George Washington its commander. This newly formed military, along with state militia forces, the French Army and Navy, and the Spanish Navy defeated the British in 1781. The new Constitution in 1789 made the president the commander in chief, with authority for the Congress to levy taxes, make the laws, and declare war. As of 2017, the U.S. Armed Forces consists of the Army, Marine Corps, Navy and Air Force, all under the command of the United States Department of Defense. There also is the United States Coast Guard, which is controlled by the Department of Homeland Security. The President of the United States is the commander-in-chief, and exercises the authority through the Secretary of Defense and the Chairman of the Joint Chiefs of Staff, which supervises combat operations. Governors have control of each state's Army and Air National Guard units for limited purposes. The president has the ability to federalize National Guard units, bringing them under the sole control of the Department of Defense. In 1763, the indigenous tribes of Pontiac's Confederacy lay siege to Fort Detroit, a British fort on the American frontier. The beginning of the United States military lies in civilian frontier settlers, armed for hunting and basic survival in the wilderness. These were organized into local militias for small military operations, mostly against Native American tribes but also to resist possible raids by the small military forces of neighboring European colonies. They relied on the British regular Army and Navy for any serious military operation. In the early years of the British colonization of North America, military action in the thirteen colonies that would become the United States were the result of conflicts with Native Americans, such as in the Pequot War of 1637, King Philip's War in 1675, the Yamasee War in 1715 and Father Rale's War in 1722. Beginning in 1689, the colonies became involved in a series of wars between Great Britain and France for control of North America, the most important of which were Queen Anne's War, in which the British conquered French colony Acadia, and the final French and Indian War (1754–63) when Britain was victorious over all the French colonies in North America. This final war was to give thousands of colonists, including Virginia colonel George Washington, military experience which they put to use during the American Revolutionary War. In the struggle for control of North America, the contest between Great Britain and France was the vital one, the conflict with Spain, a declining power, important but secondary. This latter conflict reached its height in the "War of Jenkins Ear," a prelude to the War of Austrian Succession, which began in 1739 and pitted the British and their American colonists against the Spanish. In the colonies the war involved a seesaw struggle between the Spanish in Florida and the West Indies and the English colonists in South Carolina and Georgia. Its most notable episode, however, was a British expedition mounted in Jamaica against Cartagena, the main port of the Spanish colony in Colombia. The mainland colonies furnished a regiment to participate in the assault as British Regulars under British command. The expedition ended in disaster, resulting from climate, disease, and the bungling of British commanders, and only about 600 of over 3,000 Americans who participated ever returned to their homes. The Siege of Yorktown was the decisive battle of the American Revolutionary War. 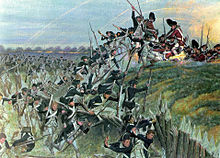 The battle was the last major land engagement in the war, with the British Army's defeat at Yorktown prompting the British to negotiate an end to the conflict. Ongoing political tensions between Great Britain and the thirteen colonies reached a crisis in 1774 when the British placed the province of Massachusetts under martial law after the Patriots protested taxes they regarded as a violation of their constitutional rights as Englishmen. When shooting began at Lexington and Concord in April 1775, militia units from across New England rushed to Boston and bottled up the British in the city. The Continental Congress appointed George Washington as commander-in-chief of the newly created Continental Army, which was augmented throughout the war by colonial militia. In addition to the Army, Congress also created the Continental Navy and Continental Marines. He drove the British out of Boston but in late summer 1776 they returned to New York and nearly captured Washington's army. Meanwhile, the revolutionaries expelled British officials from the 13 states, and declared themselves an independent nation on 4 July 1776. The British, for their part, lacked both a unified command and a clear strategy for winning. With the use of the Royal Navy, the British were able to capture coastal cities, but control of the countryside eluded them. A British sortie from Canada in 1777 ended with the disastrous surrender of a British army at Saratoga. With the coming in 1777 of General von Steuben, the training and discipline along Prussian lines began, and the Continental Army began to evolve into a modern force. France and Spain then entered the war against Great Britain as Allies of the US, ending its naval advantage and escalating the conflict into a world war. The Netherlands later joined France, and the British were outnumbered on land and sea in a world war, as they had no major allies apart from Indian tribes, Loyalists and Hessians. A shift in focus to the southern American states in 1779 resulted in a string of victories for the British, but General Nathanael Greene engaged in guerrilla warfare and prevented them from making strategic headway. The main British army was surrounded by Washington's American and French forces at Yorktown in 1781, as the French fleet blocked a rescue by the Royal Navy. The British then sued for peace. General George Washington (1732–99) proved an excellent organizer and administrator, who worked successfully with Congress and the state governors, selecting and mentoring his senior officers, supporting and training his troops, and maintaining an idealistic Republican Army. His biggest challenge was logistics, since neither Congress nor the states had the funding to provide adequately for the equipment, munitions, clothing, paychecks, or even the food supply of the soldiers. As a battlefield tactician Washington was often outmaneuvered by his British counterparts. As a strategist, however, he had a better idea of how to win the war than they did. The British sent four invasion armies. Washington's strategy forced the first army out of Boston in 1776, and was responsible for the surrender of the second and third armies at Saratoga (1777) and Yorktown (1781). He limited the British control to New York and a few places while keeping Patriot control of the great majority of the population. The Loyalists, on whom the British had relied too heavily, comprised about 20% of the population but were never well organized. As the war ended, Washington watched proudly as the final British army quietly sailed out of New York City in November 1783, taking the Loyalist leadership with them. Washington astonished the world when, instead of seizing power, he retired quietly to his farm in Virginia. Patriots had a strong distrust of a permanent "standing army", so the Continental Army was quickly demobilized, with land grants to veterans. General Washington, who throughout the war deferred to elected officials, averted a potential coup d'état and resigned as commander-in-chief after the war, establishing a tradition of civil control of the U.S. military. The Battle of Fallen Timbers was a decisive battle in the Northwest Indian War, where American forces defeated the tribes of the Western Confederacy. Following the American Revolutionary War, the United States faced potential military conflict on the high seas as well as on the western frontier. The United States was a minor military power during this time, having only a modest army, marine corps, and navy. A traditional distrust of standing armies, combined with faith in the abilities of local militia, precluded the development of well-trained units and a professional officer corps. Jeffersonian leaders preferred a small army and navy, fearing that a large military establishment would involve the United States in excessive foreign wars, and potentially allow a domestic tyrant to seize power. In the Treaty of Paris after the Revolution, the British had ceded the lands between the Appalachian Mountains and the Mississippi River to the United States, without consulting the Shawnee, Cherokee, Choctaw and other smaller tribes who lived there. Because many of the tribes had fought as allies of the British, the United States compelled tribal leaders to sign away lands in postwar treaties, and began dividing these lands for settlement. This provoked a war in the Northwest Territory in which the U.S. forces performed poorly; the Battle of the Wabash in 1791 was the most severe defeat ever suffered by the United States at the hands of American Indians. President Washington dispatched a newly trained army to the region led by General Anthony Wayne, which decisively defeated the Indian confederacy at the Battle of Fallen Timbers in 1794. "We have met the enemy and they are ours." Commodore Oliver Hazard Perry's victory on Lake Erie in 1813 was an important battle in the War of 1812. By far the largest military action in which the United States engaged during this era was the War of 1812. With Britain locked in a major war with Napoleon's France, its policy was to block American shipments to France. The United States sought to remain neutral while pursuing overseas trade. 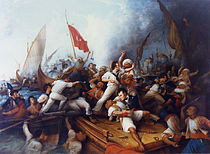 Britain cut the trade and impressed seamen on American ships into the Royal Navy, despite intense protests. Britain supported an Indian insurrection in the American Midwest, with the goal of creating an Indian state there that would block American expansion. The United States finally declared war on the United Kingdom in 1812, the first time the U.S. had officially declared war. Not hopeful of defeating the Royal Navy, the U.S. attacked the British Empire by invading British Canada, hoping to use captured territory as a bargaining chip. The invasion of Canada was a debacle, though concurrent wars with Native Americans on the western front (Tecumseh's War and the Creek War) were more successful. After defeating Napoleon in 1814, Britain sent large veteran armies to invade New York, raid Washington and capture the key control of the Mississippi River at New Orleans. The New York invasion was a fiasco after the much larger British army retreated to Canada. The raiders succeeded in the burning of Washington on 25 August 1814, but were repulsed in their Chesapeake Bay Campaign at the Battle of Baltimore and the British commander killed. The major invasion in Louisiana was stopped by a one-sided military battle that killed the top three British generals and thousands of soldiers. The winners were the commanding general of the Battle of New Orleans, Major General Andrew Jackson, who became president and the Americans who basked in a victory over a much more powerful nation. The peace treaty proved successful, and the U.S. and Britain never again went to war. The losers were the Indians, who never gained the independent territory in the Midwest promised by Britain. American forces storming Chapultepec Castle during the Mexican–American War. With the rapid expansion of the farming population, Democrats looked to the west for new lands, an idea which became known as "Manifest Destiny." In the Texas Revolution (1835–36), the settlers declared independence and defeated the Mexican army, but Mexico was determined to reconquer the lost province and threatened war with the U.S. if it annexed Texas. The U.S., much larger and more powerful, did annex Texas in 1845 and war broke out in 1846 over boundary issues. In the Mexican–American War 1846–48, the U.S. Army under Generals Zachary Taylor and Winfield Scott and others, invaded and after a series of victorious battles (and no major defeats) seized New Mexico and California, and also blockaded the coast, invaded northern Mexico, and invaded central Mexico, capturing the national capital. The peace terms involved American purchase of the area from California to New Mexico for $10 million. Long-building tensions between the Northern and Southern States over slavery suddenly reached a climax after the 1860 election of Abraham Lincoln of the new anti-slavery Republican Party as U.S. President. Southern states seceded from the U.S. and formed a separate Confederacy. Within the Confederate states, many U.S. forts with garrisons still loyal to the Union were cut off. Fighting started in 1861 when Fort Sumter was fired upon. The American Civil War caught both sides unprepared. Neither the North's small standing army nor the South's scattered state militias were capable of winning a civil war. Both sides raced to raise armies—larger than any U.S. forces before—first with repeated calls for volunteers, but eventually resorting to unpopular large-scale conscription for the first time in U.S. history. 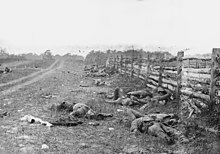 The Battle of Gettysburg involved the largest number of casualties of the entire war. The North initially sought a quick victory by trying to capture the Confederate capital at Richmond, Virginia, not far from the U.S. capital at Washington, D.C. The South hoped to win by getting Britain and France to intervene, or else by exhausting the North's willingness to fight. The Confederates under General Robert E. Lee skillfully and tenaciously defended their capital until the very end, while the North struggled to find any general to match. As the fighting between the two capitals stalled, the North found more success in campaigns elsewhere, using rivers, railroads, and the seas to help move and supply their larger forces, putting a stranglehold on the South—the Anaconda Plan. The war spilled across the continent, and even to the high seas. After four years of appallingly bloody conflict, with more casualties than all other U.S. wars combined, the North's larger population and industrial might slowly ground the South down. The resources and economy of the South were ruined, while the North's factories and economy prospered filling government wartime contracts. 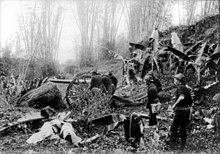 The American Civil War is sometimes called the "first modern war" due to the mobilization and destruction of the civilian base—total war—and due to by many technical military innovations involving railroads, telegraphs, rifles, trench warfare, and ironclad warships with turret guns. American forces led by George Custer suffered a major defeat against the Sioux in the Battle of Little Bighorn. After the Civil War, population expansion, railroad construction, and the disappearance of the buffalo herds heightened military tensions on the Great Plains. Several tribes, especially the Sioux and Comanche, fiercely resisted confinement to reservations. The main role of the Army was to keep indigenous peoples on reservations and to end their wars against settlers and each other, William Tecumseh Sherman and Philip Sheridan were in charge. 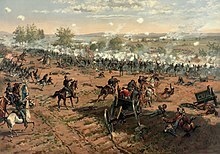 A famous victory for the Plains Nations was the Battle of the Little Big Horn in 1876, when Col. George Armstrong Custer and two hundred plus members of the 7th Cavalry were killed by a force consisting of Native Americans from the Lakota, Northern Cheyenne, and Arapaho nations. The last significant conflict came in 1891. 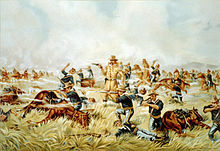 Charge by the Rough Riders during the Battle of San Juan Hill. The Spanish–American War was a short decisive war marked by quick, overwhelming American victories at sea and on land against Spain. The Navy was well-prepared and won laurels, even as politicians tried (and failed) to have it redeployed to defend East Coast cities against potential threats from the feeble Spanish fleet. The Army performed well in combat in Cuba. However, it was too oriented to small posts in the West and not as well-prepared for an overseas conflict. It relied on volunteers and state militia units, which faced logistical, training and food problems in the staging areas in Florida. The United States freed Cuba (after an occupation by the U.S. Army). By the peace treaty Spain ceded to the United States its colonies of Puerto Rico, Guam, and the Philippines. The Navy set up coaling stations there and in Hawaii (which voluntarily joined the U.S. in 1898). The U.S. Navy now had a major forward presence across the Pacific and (with the lease of Guantánamo Bay Naval Base in Cuba) a major base in the Caribbean guarding the approaches to the Gulf Coast and the Panama Canal. American soldiers in Manila during the Philippine–American War. To win its first colonies, the U.S. had lost 385 KIA (369 Army, 10 Navy, 6 Marines); 1,662 WIA (1,594 Army, 47 Navy, 21 Marines); and 2,061 dead of disease in the combat zones (a total of 5,403 died of disease at all locations, including stateside posts). Total Spanish combat deaths in action against U.S. forces were about 900. The Philippine–American War (1899–1902) was an armed conflict between a group of Filipino revolutionaries and the American forces following the ceding of the Philippines to the United States after the defeat of Spanish forces in the Battle of Manila. The Army sent in 100,000 soldiers (mostly from the National Guard) under General Elwell Otis. Defeated in the field and losing its capital in March 1899, the poorly armed and poorly led rebels broke into armed bands. The insurgency collapsed in March 1901 when the leader Emilio Aguinaldo was captured by General Frederick Funston and his Macabebe allies. Casualties included 1,037 Americans killed in action and 3,340 who died from disease; 20,000 rebels were killed. The Navy was modernized in the 1880s, and by the 1890s had adopted the naval power strategy of Captain Alfred Thayer Mahan—as indeed did every major navy. The old sailing ships were replaced by modern steel battleships, bringing them in line with the navies of Britain and Germany. In 1907, most of the Navy's battleships, with several support vessels, dubbed the Great White Fleet, were featured in a 14-month circumnavigation of the world. Ordered by President Theodore Roosevelt, it was a mission designed to demonstrate the Navy's capability to extend to the global theater. The Great White Fleet at the Straits of Magellan. The fleet set out to make friendly visits to other countries, and showcase America's naval power to the world. Rear Admiral Bradley A. Fiske was at the vanguard of new technology in naval guns and gunnery, thanks to his innovations in fire control 1890–1910. He immediately grasped the potential for air power, and called for the development of a torpedo plane. Fiske, as aide for operations in 1913–15 to Assistant Secretary Franklin D. Roosevelt, proposed a radical reorganization of the Navy to make it a war-fighting instrument. Fiske wanted to centralize authority in a chief of naval operations and an expert staff that would develop new strategies, oversee the construction of a larger fleet, coordinate war planning including force structure, mobilization plans, and industrial base, and ensure that the US Navy possessed the best possible war machines. Eventually, the Navy adopted his reforms and by 1915 started to reorganize for possible involvement in the World War then underway. William Allen Rogers' cartoon depicting Theodore Roosevelt's Big Stick policy. The enforcement of this policy in Latin America led to several U.S. interventions in the region, referred to as the Banana Wars. "Banana Wars" is an informal term for the minor intervention in Latin America from 1898 until 1934. These include military presence in Cuba, Panama with the Panama Canal Zone, Haiti (1915–1935), Dominican Republic (1916–1924) and Nicaragua (1912–1925) & (1926–1933). The U.S. Marine Corps began to specialize in long-term military occupation of these countries, primarily to safeguard customs revenues which were the cause of local civil wars. Banditry and guerrilla resistance was endemic throughout the period of occupation. U.S. Marine losses in the Dominican Republic, 1916–22, totaled 17 killed, 54 dead of disease, 55 wounded (from a peak strength of 3,000). The Marines inflicted about 1,000 Dominican casualties. The most serious insurgencies occurred in Haiti, where some 5,000 rough mountaineers of the north, called Cacos, rebelled in 1915–17, losing 200 killed, to Marine losses of 3 KIA, 18 WIA, of 2,029 deployed. In 1918, the Cacos, angered by the Marine-enforced practice of corvée (forced labor), followed the leadership of Charlemagne Peralte and Benoit Batraville into rebellion again, against the 1,500-man 1st Marine Brigade and the 2,700-man Haitian Gendarmerie. The rebellion lasted for more than 19 months, October 17, 1918–May 19, 1920. Both Caco leaders were killed in battle, along with at least 2,004 of their men. The Marines lost 28 slain in action and the Gendarmerie lost 70 killed. The Moro Rebellion was an armed insurgency between Muslim Filipino tribes in the southern Philippines between 1899 and 1913. Pacification was never complete as sporadic antigovernment insurgency continues into the 21st century, with American advisors helping the Philippine government forces. American and Mexican soldiers guarding the border in Ambos Nogales during the Border War. The Mexican Revolution involved a civil war with hundreds of thousands of deaths and large numbers fleeing combat zones. Tens of thousands fled to the U.S. President Wilson sent U.S. forces to occupy the Mexican city of Veracruz for six months in 1914. 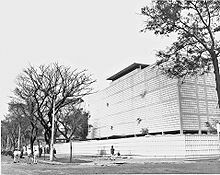 It was designed to show the U.S. was keenly interested in the civil war and would not tolerate attacks on Americans, especially the 9 April 1914, "Tampico Affair", which involved the arrest of American sailors by soldiers of the regime of Mexican President Victoriano Huerta. In early 1916 Pancho Villa a Mexican general ordered 500 soldiers on a murderous raid on the American city of Columbus New Mexico, with the goal of robbing banks to fund his army. The German Secret Service encouraged Pancho Villa in his attacks to involve the United States in an intervention in Mexico which would distract the United States from its growing involvement in the war and divert aid from Europe to support the intervention. Wilson called up the state militias (National Guard) and sent them and the U.S. Army under General John J. Pershing to punish Villa in the Pancho Villa Expedition. Villa fled, with the Americans in pursuit deep into Mexico, thereby arousing Mexican nationalism. By early 1917 President Venustiano Carranza had contained Villa and secured the border, so Wilson ordered Pershing to withdraw. 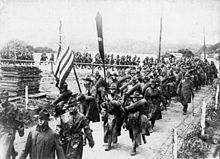 The American Expeditionary Force marches in France, 1918. The United States originally wished to remain neutral when World War I broke out in August 1914. However, it insisted on its right as a neutral party to immunity from German submarine attack, even though its ships carried food and raw materials to Britain. In 1917 the Germans resumed submarine attacks, knowing that it would lead to American entry. When the United States declared war in early April 1917, the United States Army was still small by European standards (most of which had conscription) and mobilization would take at least a year. Meanwhile, the United States continued to provide supplies and money to Britain and France, and initiated the first peacetime draft. Industrial mobilization took longer than expected, so divisions were sent to Europe without equipment, relying instead on the British and French to supply them. By summer 1918, a million American soldiers, or "doughboys" as they were often called, of the American Expeditionary Force (AEF) were in Europe, serving on the Western Front under the command of General John Pershing, with 25,000 more arriving every week. The failure of the German Army's Spring Offensive exhausted its manpower reserves and they were unable to launch new offensives. The Imperial German Navy and home front then revolted and a new German government signed a conditional surrender, the Armistice, ending the war on the Western Front on 11 November 1918. The so-called Polar Bear Expedition was the involvement of 5,000 U.S. troops, during the Russian Revolution, in blocking the Bolsheviks in Arkhangelsk, Russia as part of the greater Allied military expedition in the Russian Civil War. The Washington Naval Conference was an arms control conference that sought to limit naval armaments amongst the world's powers. After the costly U.S. involvement in World War I, isolationism grew within the nation. Congress refused membership in the League of Nations, particularly due to Article X of the League's charter. Pursuant to Article X, the charter would have required by contract the United States Military to intervene if a member of the League were attacked; this prompted the United States Senate to vehemently oppose the Treaty of Versailles. Isolationism further grew after the events of the Nye Committee, which investigated corrupt military spending and fueled the Merchants of death argument, thus increasing anti-war opinions. In response to the growing turmoil in Europe and Asia, the gradually more restrictive Neutrality Acts were passed, which were intended to prevent the U.S. from supporting either side in a war. President Franklin D. Roosevelt sought to support Britain, however, and in 1940 signed the Lend-Lease Act, which permitted an expansion of the "cash and carry" arms trade to develop with Britain, which controlled the Atlantic sea lanes. Roosevelt favored the Navy (he was in effective charge in World War I), and used relief programs such as the PWA to support Navy yards and build warships. For example, in 1933 he authorized $238 million in PWA funds for thirty-two new ships. The Army Air Corps received only $11 million, which barely covered replacements and allowed no expansion. Due to the underlying pressure against military involvement by both citizens and politicians, the United States was reluctant to intervene in any overseas conflicts. The involvement that the United States had toward the Japanese Invasion of Manchuria in 1931 only extended as far as non-recognition. Other events such as Benito Mussolini's Italian Conquest of Ethiopia went ignored by the U.S. along with the League of Nations being unable to act upon the usage of chemical weapons by the Italian fascists. No official involvement was waged during the Spanish Civil War and the Second Sino-Japanese War, though both wars utilized loopholes for U.S. involvement, such as volunteering and using British ships as a middleman for delivering provisions (since the Neutrality Acts only specified American ships). This, along with Roosevelt's Quarantine Speech, produced mixed opinions among Americans that were still anxious about military involvement. Non-interventionists were mainly constituent in the Republican Party, but other Democratic politicians, such as Louis Ludlow, attempted to pass bills to compromise and even amend the United States Constitution for the purpose of calling for public Referendum to decide military involvement in cases that do not immediately follow an attack on the United States. This amendment was introduced many times, but failed to gain enough support, including opposition even by Roosevelt. The overall neglect for military involvement eventually resulted in appeasement in the early stages of World War II, at the distress of Roosevelt (who wanted to continue cash-and-carry for the European theatres and the Pacific). After being rebuffed by Congress for attempting to reinstate cash-and-carry for the European theatres, Roosevelt eventually won the favor of restoring the arms trade with belligerent nations after Germany's invasion of Poland, which is said by many to have fixed the United States economy. Total involvement in the war began after the Attack on Pearl Harbor, where isolationism began to cede. 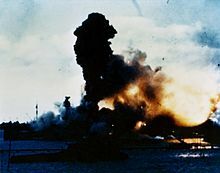 The explosion aboard the USS Arizona during the attack on Pearl Harbor. Starting in 1940 (18 months before Pearl Harbor), the nation mobilized, giving high priority to air power. American involvement in World War II in 1940–41 was limited to providing war material and financial support to Britain, the Soviet Union, and the Republic of China. The U.S. entered officially on 8 December 1941 following the Japanese attack on Pearl Harbor, Hawaii. Japanese forces soon seized American, Dutch, and British possessions across the Pacific and Southeast Asia, except for Australia, which became a main American forward base along with Hawaii. The loss of eight battleships and 2,403 Americans at Pearl Harbor forced the U.S. to rely on its remaining aircraft carriers, which won a major victory over Japan at Midway just six months into the war, and on its growing submarine fleet. The Navy and Marine Corps followed this up with an island hopping campaign across the central and south Pacific in 1943–45, reaching the outskirts of Japan in the Battle of Okinawa. During 1942 and 1943, the U.S. deployed millions of men and thousands of planes and tanks to the UK, beginning with the strategic bombing of Nazi Germany and occupied Europe and leading up to the Allied invasions of occupied North Africa in November 1942, Sicily and Italy in 1943, France in 1944, and the invasion of Germany in 1945, parallel with the Soviet invasion from the east. That led to the surrender of Nazi Germany in May 1945. While the final European Axis Powers were defeated within a year of Operation Overlord, the fighting in Central Europe was especially bloody for the United States, with more US military deaths occurring in Germany than in any other country during the war. 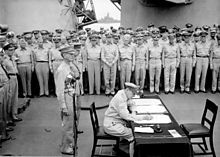 In the Pacific, the U.S. experienced much success in naval campaigns during 1944, but bloody battles at Iwo Jima and Okinawa in 1945 led the U.S. to look for a way to end the war with minimal loss of American lives. The U.S. used atomic bombs on Hiroshima and Nagasaki to destroy the Japanese war effort and to shock the Japanese leadership, which quickly caused the surrender of Japan. Following the dropping of atomic bombs on Hiroshima and Nagasaki, Japan surrendered to the Allied forces on 15 August 1945, ending 35 years of Japanese occupation of Korean Peninsula. 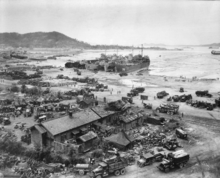 American forces under General John R. Hodge arrived at the southern part of the Korean Peninsula on 8 September 1945, while the Soviet Army and some Korean Communists had stationed themselves in the northern part of the Korean Peninsula. The United States was able to mobilize quickly, eventually becoming the dominant military power in most theaters of the war (excepting only eastern Europe), and the industrial might of the U.S. economy became a major factor in the Allies' mobilization of resources. Strategic and tactical lessons learned by the U.S., such as the importance of air superiority and the dominance of the aircraft carrier in naval actions, continue to guide U.S. military doctrine into the 21st century. World War II holds a special place in the American psyche as the country's greatest triumph, and the U.S. military personnel of World War II are frequently referred to as "the Greatest Generation." Over 16 million served (about 11% of the population), and over 400,000 died during the war. The U.S. emerged as one of the two undisputed superpowers along with the Soviet Union, and unlike the Soviet Union, the U.S. homeland was virtually untouched by the ravages of war. During and following World War II, the United States and Britain developed an increasingly strong defense and intelligence relationship. Manifestations of this include extensive basing of U.S. forces in the UK, shared intelligence, shared military technology (e.g. nuclear technology), and shared procurement. Following World War II, the United States emerged as a global superpower vis-a-vis the Soviet Union in the Cold War. In this period of some forty years, the United States provided foreign military aid and direct involvement in proxy wars against the Soviet Union. It was the principal foreign actor in the Korean War and Vietnam War during this era. Nuclear weapons were held in ready by the United States under a concept of mutually assured destruction with the Soviet Union. The war started badly for the US and UN. North Korean forces struck massively in the summer of 1950 and nearly drove the outnumbered US and ROK defenders into the sea. However the United Nations intervened, naming Douglas MacArthur commander of its forces, and UN-US-ROK forces held a perimeter around Pusan, gaining time for reinforcement. MacArthur, in a bold but risky move, ordered an amphibious invasion well behind the front lines at Inchon, cutting off and routing the North Koreans and quickly crossing the 38th Parallel into North Korea. As UN forces continued to advance toward the Yalu River on the border with Communist China, the Chinese crossed the Yalu River in October and launched a series of surprise attacks that sent the UN forces reeling back across the 38th Parallel. Truman originally wanted a Rollback strategy to unify Korea; after the Chinese successes he settled for a Containment policy to split the country. MacArthur argued for rollback but was fired by President Harry Truman after disputes over the conduct of the war. Peace negotiations dragged on for two years until President Dwight D. Eisenhower threatened China with nuclear weapons; an armistice was quickly reached with the two Koreas remaining divided at the 38th parallel. North and South Korea are still today in a state of war, having never signed a peace treaty, and American forces remain stationed in South Korea as part of American foreign policy. Several hundred Marines were sent to Lebanon during the 1958 crisis to bolster the pro-Western government. In the 1958 Lebanon crisis that threatened civil war, Operation Blue Bat deployed several hundred Marines to bolster the pro-Western Lebanese government from 15 July to 25 October 1958. On 28 April 1965, 400 Marines were landed in Santo Domingo to evacuate the American Embassy and foreign nationals after dissident Dominican armed forces attempted to overthrow the ruling civilian junta. By mid-May, peak strength of 23,850 U.S. soldiers, Marines, and Airmen were in the Dominican Republic and some 38 naval ships were positioned offshore. They evacuated nearly 6,500 men, women, and children of 46 nations, and distributed more than 8 million tons of food. The intervention cost the U.S. 27 KIA and 172 WIA. Another 20 Americans died from non-hostile causes; 111 were seriously injured. Ten of the KIA were Marines; 13 were from the 82nd Airborne. Among the 2,850 Dominican dead were 325 National Police officers and 500 members of the armed forces. An estimated 600 rebels were killed. Civilians accounted for the remainder. 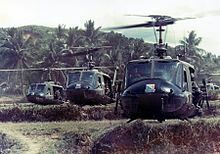 The Vietnam War was a war fought between 1955 and 1975 on the ground in South Vietnam and bordering areas of Cambodia and Laos (see Secret War) and in the strategic bombing (see Operation Rolling Thunder) of North Vietnam. American advisors came in the late 1950s to help the RVN (Republic of Vietnam) combat Communist insurgents known as "Viet Cong." Major American military involvement began in 1964, after Congress provided President Lyndon B. Johnson with blanket approval for presidential use of force in the Gulf of Tonkin Resolution. The military history of the American side of the war involved different strategies over the years. The bombing campaigns of the Air Force were tightly controlled by the White House for political reasons, and until 1972 avoided the main Northern cities of Hanoi and Haiphong and concentrated on bombing jungle supply trails, especially the Ho Chi Minh Trail. The most controversial Army commander was William Westmoreland whose strategy involved systematic defeat of all enemy forces in the field, despite heavy American casualties that alienated public opinion back home. Memories and lessons from the war are still a major factor in American politics. One side views the war as a necessary part of the Containment policy, which allowed the enemy to choose the time and place of warfare. Others note the U.S. made major strategic gains as the Communists were defeated in Indonesia, and by 1972 both Moscow and Beijing were competing for American support, at the expense of their allies in Hanoi. Critics see the conflict as a "quagmire"—an endless waste of American blood and treasure in a conflict that did not concern US interests. Fears of another quagmire have been major factors in foreign policy debates ever since. The draft became extremely unpopular, and President Nixon ended it in 1973, forcing the military (the Army especially) to rely entirely upon volunteers. That raised the issue of how well the professional military reflected overall American society and values; the soldiers typically took the position that their service represented the highest and best American values. In 1983, American forces, assisted by the Caribbean Peace Force, invaded the island nation of Grenada. In October, 1983, a power struggle in Grenada, which had installed a communist-leaning government, led to increased tensions in the region. Neighboring nations asked the U.S. to intervene. The invasion was a hurriedly devised grouping of paratroopers, Marines, Rangers, and special operations forces in Operation Urgent Fury. Over a thousand Americans quickly seized the entire island, taking hundreds of military and civilian prisoners, especially Cubans, who were building a large military airstrip. In 1983 fighting between Palestinian refugees and Lebanese factions reignited that nation's long-running civil war. A UN agreement brought an international force of peacekeepers to occupy Beirut and guarantee security. US Marines landed in August 1982 along with Italian and French forces. On 23 October 1983, a suicide bomber driving a truck filled with 6 tons of TNT crashed through a fence and destroyed the Marine barracks, killing 241 Marines; seconds later, a second bomber leveled a French barracks, killing 58. Subsequently, the US Navy engaged in bombing of militia positions inside Lebanon. While US President Ronald Reagan was initially defiant, political pressure at home eventually forced the withdrawal of the Marines in February 1984. In 1986, the USAF conducted air strikes against Libya, in retaliation for the West Berlin discotheque bombing. Code-named "Operation El Dorado Canyon", comprised the joint United States Air Force, Navy, and Marine Corps air-strikes against Libya on 15 April 1986. The attack was carried out in response to the 1986 Berlin discotheque bombing, and resulted in the killing of 45 officers and 15 civilians. On 20 December 1989 the United States invaded Panama, mainly from U.S. bases within the then-Canal Zone, to oust dictator and international drug trafficker Manuel Noriega. American forces quickly overwhelmed the Panamanian Defense Forces, Noriega was captured on 3 January 1990 and imprisoned in the U.S. and a new government was installed. The Persian Gulf War was a conflict between Iraq and a coalition force of 34 nations led by the United States. The lead up to the war began with the Iraqi invasion of Kuwait in August 1990 which was met with immediate economic sanctions by the United Nations against Iraq. The coalition commenced hostilities in January 1991, resulting in a decisive victory for the U.S. led coalition forces, which drove Iraqi forces out of Kuwait with minimal coalition deaths. Despite the low death toll, over 180,000 US veterans would later be classified as "permanently disabled" according to the US Department of Veterans Affairs (see Gulf War Syndrome). The main battles were aerial and ground combat within Iraq, Kuwait and bordering areas of Saudi Arabia. Land combat did not expand outside of the immediate Iraq/Kuwait/Saudi border region, although the coalition bombed cities and strategic targets across Iraq, and Iraq fired missiles on Israeli and Saudi cities. Before the war, many observers believed the US and its allies could win but might suffer substantial casualties (certainly more than any conflict since Vietnam), and that the tank battles across the harsh desert might rival those of North Africa during World War II. After nearly 50 years of proxy wars, and constant fears of another war in Europe between NATO and the Warsaw Pact, some thought the Persian Gulf War might finally answer the question of which military philosophy would have reigned supreme. Iraqi forces were battle-hardened after 8 years of war with Iran, and they were well equipped with late model Soviet tanks and jet fighters, but the antiaircraft weapons were crippled; in comparison, the US had no large-scale combat experience since its withdrawal from Vietnam nearly 20 years earlier, and major changes in US doctrine, equipment and technology since then had never been tested under fire. However, the battle was one-sided almost from the beginning. The reasons for this are the subject of continuing study by military strategists and academics. There is general agreement that US technological superiority was a crucial factor but the speed and scale of the Iraqi collapse has also been attributed to poor strategic and tactical leadership and low morale among Iraqi troops, which resulted from a history of incompetent leadership. After devastating initial strikes against Iraqi air defenses and command and control facilities on 17 January 1991, coalition forces achieved total air superiority almost immediately. The Iraqi air force was destroyed within a few days, with some planes fleeing to Iran, where they were interned for the duration of the conflict. The overwhelming technological advantages of the US, such as stealth aircraft and infrared sights, quickly turned the air war into a "turkey shoot". The heat signature of any tank which started its engine made an easy target. Air defense radars were quickly destroyed by radar-seeking missiles fired from wild weasel aircraft. Grainy video clips, shot from the nose cameras of missiles as they aimed at impossibly small targets, were a staple of US news coverage and revealed to the world a new kind of war, compared by some to a video game. Over 6 weeks of relentless pounding by planes and helicopters, the Iraqi army was almost completely beaten but did not retreat, under orders from Iraqi President Saddam Hussein, and by the time the ground forces invaded on 24 February, many Iraqi troops quickly surrendered to forces much smaller than their own; in one instance, Iraqi forces attempted to surrender to a television camera crew that was advancing with coalition forces. American soldiers taking fire during the Battle of Mogadishu. The battle led to the withdrawal of U.S. forces in Somalia, and the end of American support for UNOSOM II. US troops participated in a UN peacekeeping mission in Somalia beginning in 1992. By 1993 the US troops were augmented with Rangers and special forces with the aim of capturing warlord Mohamed Farrah Aidid, whose forces had massacred peacekeepers from Pakistan. During a raid in downtown Mogadishu, US troops became trapped overnight by a general uprising in the Battle of Mogadishu. Eighteen American soldiers were killed, and a US television crew filmed graphic images of the body of one soldier being dragged through the streets by an angry mob. Somali guerrillas paid a staggering toll at an estimated 1,000–5,000 total casualties during the conflict. After much public disapproval, American forces were quickly withdrawn by President Bill Clinton. The incident profoundly affected US thinking about peacekeeping and intervention. The book Black Hawk Down was written about the battle, and was the basis for the later movie of the same name. Operation Uphold Democracy (19 September 1994 – 31 March 1995) was an intervention designed to reinstate the elected President Jean-Bertrand Aristide, who was reported to have died in office during the bombing of the presidential palace. The operation was effectively authorized by the 31 July 1994 United Nations Security Council Resolution 940. During the war in Yugoslavia in the early 1990s, the US operated in Bosnia and Herzegovina as part of the NATO-led multinational implementation force (IFOR) in Operation Joint Endeavour. The USA was one of the NATO member countries who bombed Yugoslavia between 24 March and 9 June 1999 during the Kosovo War and later contributed to the multinational force KFOR. The War on Terrorism is a global effort by the governments of several countries (primarily the United States and its principal allies) to neutralize international terrorist groups (primarily Islamic Extremist terrorist groups, including al-Qaeda) and ensure that countries considered by the US and some of its allies to be Rogue Nations no longer support terrorist activities. It has been adopted primarily as a response to the September 11, 2001 attacks on the United States. Since 2001, terrorist motivated attacks upon service members have occurred in Arkansas and Texas. 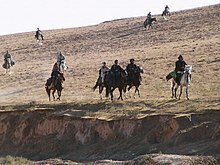 U.S. Army Special Forces and U.S. Air Force Combat Controllers on horseback in November 2001. The intervention in Afghanistan (Operation Enduring Freedom – Afghanistan) to depose that country's Taliban government and destroy training camps associated with al-Qaeda is understood to have been the opening, and in many ways defining, campaign of the broader War on Terrorism. The emphasis on Special Operations Forces (SOF), political negotiation with autonomous military units, and the use of proxy militaries marked a significant change from prior U.S. military approaches. In January 2002, the U.S. sent more than 1,200 troops (later raised to 2,000) to assist the Armed Forces of the Philippines in combating terrorist groups linked to al-Qaida, such as Abu Sayyaf, under Operation Enduring Freedom – Philippines. Operations have taken place mostly in the Sulu Archipelago, where terrorists and other groups are active. The majority of troops provide logistics. However, there are special forces troops that are training and assisting in combat operations against the terrorist groups. After the lengthy Iraq disarmament crisis culminated with an American demand that Iraqi President Saddam Hussein leave Iraq, which was refused, a coalition led by the United States and the United Kingdom fought the Iraqi army in the 2003 invasion of Iraq. Approximately 250,000 United States troops, with support from 45,000 British, 2,000 Australian and 200 Polish combat forces, entered Iraq primarily through their staging area in Kuwait. (Turkey had refused to permit its territory to be used for an invasion from the north.) Coalition forces also supported Iraqi Kurdish militia, estimated to number upwards of 50,000. After approximately three weeks of fighting, Hussein and the Ba'ath Party were forcibly removed, followed by 9 years of military presence by the United States and the coalition fighting alongside the newly elected Iraqi government against various insurgent groups. With the emergence of ISIL and its capture of large areas of Iraq and Syria, a number of crises resulted that sparked international attention. ISIL had perpetrated sectarian killings and war crimes in both Iraq and Syria. Gains made in the Iraq War were rolled back as Iraqi army units abandoned their posts. Cities were taken over by the terrorist group which enforced its brand of Sharia law. The kidnapping and decapitation of numerous Western journalists and aid-workers also garnered interest and outrage among Western powers. The US intervened with airstrikes in Iraq over ISIL held territories and assets in August, and in September a coalition of US and Middle Eastern powers initiated a bombing campaign in Syria aimed at degrading and destroying ISIL and Al-Nusra-held territory. By December 2017, ISIL had no remaining territory in Iraq, following the 2017 Western Iraq campaign. Airstrikes by US and Coalition forces have continued in Syria against the Assad government especially after the Douma chemical attack in 2018. As a result of the Libyan Civil War, the United Nations enacted United Nations Security Council Resolution 1973, which imposed a no-fly zone over Libya, and the protection of civilians from the forces of Muammar Gaddafi. The United States, along with Britain, France and several other nations, committed a coalition force against Gaddafi's forces. On 19 March 2011, the first U.S. action was taken when 114 Tomahawk missiles launched by US and UK warships destroyed shoreline air defenses of the Gaddafi regime. The U.S. continued to play a major role in Operation Unified Protector, the NATO-directed mission that eventually incorporated all of the military coalition's actions in the theater. Throughout the conflict however, the U.S. maintained it was playing a supporting role only and was following the UN mandate to protect civilians, while the real conflict was between Gaddafi's loyalists and Libyan rebels fighting to depose him. During the conflict, American drones were also deployed. ^ Jim Newton (2011). Eisenhower: The White House Years. Random House. p. 129. ISBN 9780385534536. ^ a b Matloff, Maurice, ed. (1969). "2. Beginnings". American Military History. Washington, DC: Office of the Chief Of Military History of Military History, United States Army. ^ Edward G. Lengel (2012). A Companion to George Washington. Wiley. p. 300. ISBN 9781118219966. ^ Justin Harvey Smith (1919). The War with Mexico. Macmillan. ^ "The Philippines". Digital History. University of Houston. 22 May 2011. Archived from the original on 25 October 2011. Retrieved 22 May 2011. In December, Spain ceded the Philippines to the United States for $20 million. ^ Germany and the Soviet Union were not invited. ^ Emily O. Goldman (2010). Sunken Treaties: Naval Arms Control Between the Wars. Pennsylvania State University Press. ISBN 978-0-271-04129-2. ^ "'The Senate and the League of Nations'". U.S. Senate. Retrieved 22 January 2018. ^ Engelbrecht, H. C.; Hanighen, F. C. (15 June 1934). Merchants of Death (PDF). Dodd, Mead & Co. Retrieved 22 January 2018. ^ Divine, Robert (1969). Roosevelt and World War II. Baltimore, MD, USA: Johns Hopkins University Press. pp. 5–48. ^ Safire 1997, pp. 297–8. ^ "Ludlow Amendment 1938". Retrieved 5 September 2006. ^ "Roosevelt Week". Time Magazine. 17 January 1938. ^ "All in – 'over-sexed, over-paid and over here'". Australia's War 1939–1945. Retrieved 2 March 2008. ^ "Fact Sheet: Pearl Harbor". Naval History & Heritage Command. United States Navy. Retrieved 13 September 2014. "Remembering Pearl Harbor" (PDF). .nationalww2museum.org. The National WWII Museum. Retrieved 13 September 2014. Shaw, Daron R. (15 September 2008). The Race to 270: The Electoral College and the Campaign Strategies of 2000 and 2004. University of Chicago Press. p. 162. ISBN 9780226751368. ^ Parrington, Alan (1997). "Mutually Assured Destruction Revisited". Airpower Journal. Archived from the original on 20 June 2015. Retrieved 11 January 2015. ^ "More than 1,700 bombs dropped in war on ISIL". Al Jazeera. 24 October 2014. Retrieved 5 January 2015. ^ "U.S. Steps Up Assault on Libya, Firing Four More Tomahawk Missiles at Air Defense Systems". Fox News. 20 March 2011. Retrieved 21 October 2011. ^ Goldman, Julianna; Johnston, Nicholas (21 March 2011). "Obama Says No Conflict in U.S. Policy, UN Libya Mandate". Bloomberg L.P. Retrieved 21 October 2011. ^ Hopkins, Nick (21 April 2011). "Drones can be used by Nato forces in Libya, says Obama". The Guardian. London. Retrieved 21 October 2011. Bradford, James C. (2003). Atlas of American military history. Oxford University Press. ISBN 978-0-19-521661-5. Brown, Jerold E. (2001). Historical Dictionary of the U.S. Army. Greenwood Publishing Group. ISBN 9780313293221. Chambers, John Whiteclay; Fred Anderson (1999). The Oxford companion to American military history. Oxford University Press. ISBN 978-0-19-507198-6. Hacker, Barton C.; Margaret Vining (2007). American Military Technology: The Life Story of a Technology. JHU Press. ISBN 978-0-8018-8772-7. Howarth, Stephen (1999). To Shining Sea: a History of the United States Navy, 1775–1998. Norman, OK: U of Oklahoma Press. ISBN 0-8061-3026-1. Lookingbill, Brad D. (2010). American Military History. John Wiley and Sons. ISBN 978-1-4051-9052-7. Love, Robert W., Jr. (1992). History of the U.S. Navy 2 vol. Moten, Matthew (2014). Presidents and Their Generals: An American History of Command in War. Harvard UP. Sweeney, Jerry K.; Kevin B. Byrne (2006). A handbook of American military history. U of Nebraska Press. ISBN 978-0-8032-9337-3. Urwin, Gregory J. W. (1983). The United States Cavalry: an illustrated history, 1776–1944. University of Oklahoma Press. ISBN 978-0-8061-3475-8. Williams, T. Harry (1960). Americans at War: The Development of the American Military System. LSU Press. ISBN 978-0-8071-2474-1. U. S. Department of the Army (2001). The Writing of American Military History: A Guide. The Minerva Group, Inc. ISBN 978-0-89875-350-9. Wikimedia Commons has media related to Military history of the United States.